Docker project: Can you have overlay2 speed and density with devicemapper? Yep. Introduced the docker-storage-setup package to help make configuring devicemapper-based storage a snap. All of that, in the name of providing enterprise-class stability, security and supportability to our valued customers. As discussed in our previous blog, there are a particular set of behaviors and attributes to take into account when choosing a graph driver. Included in those are page cache sharing, POSIX compliance and SELinux support. 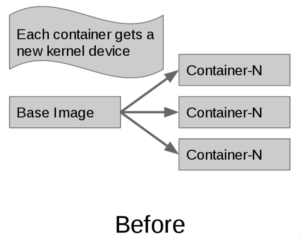 It traverses less kernel and devicemapper code on container creation (devicemapper-backed containers get a unique kernel device allocated at startup). There was no single graph driver that could give you all these attributes at the same time — until now. With the industry move towards microservices, 12-factor guidelines and dense multi-tenant platforms, many folks both inside Red Hat as well as in the community have been discussing read-only containers. In fact, there’s been a –read-only option to both the Docker project, and kubernetes for a long time. What this does is create a mount point as usual for the container, but mount it read-only as opposed to read-write. 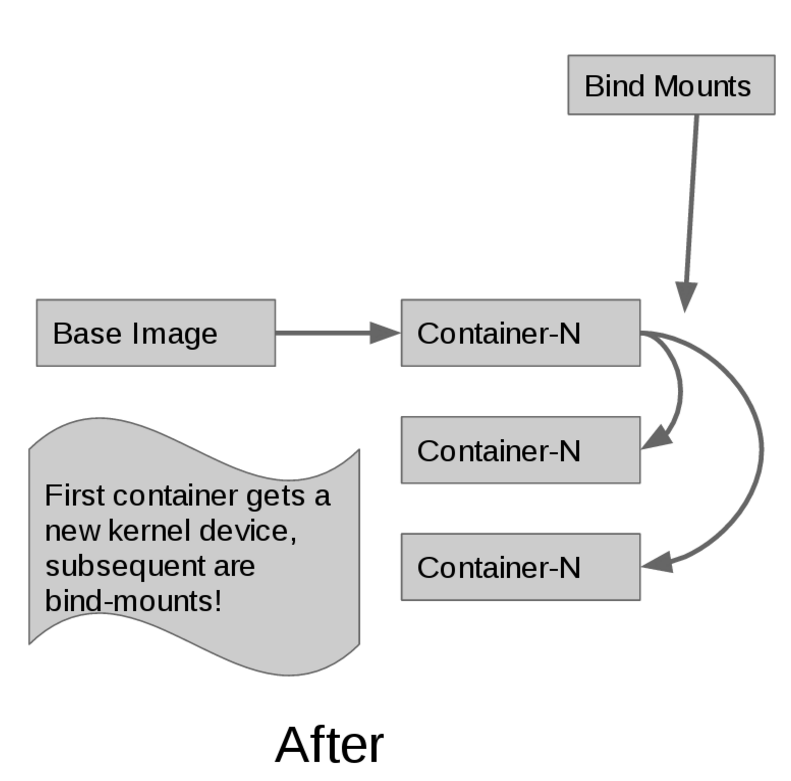 Read-only containers are an important security improvement as well as they reduce the container’s attack surface. More details on this can be found in a blog post from Dan Walsh last year. When a container is launched in this mode, it can no longer write to locations it may expect to (i.e. /var/log) and may throw errors because of this. As discussed in the Processes section of 12factor.net, re-architected applications should store stateful information (such as logs or web assets) in a stateful backing service. 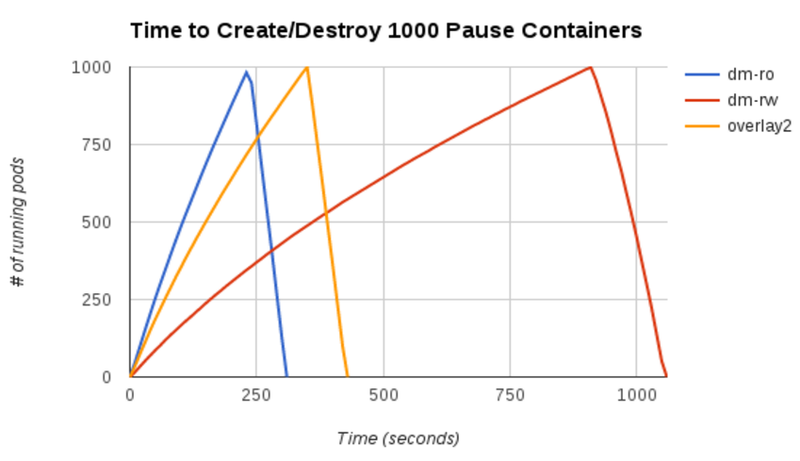 Attaching a persistent volume that is read-write fulfills this design aspect: the container can be restarted anywhere in the cluster, and its persistent volume can follow it. In other words, for applications that are not completely stateless an ideal deployment would be to couple read-only containers with read-write persistent volumes. This gets us to a place in the container world that the HPC (high performance/scientific computing) world has been at for decades: thousands of diskless, read-only NFS-root booted nodes that mount their necessary applications and storage over the network at boot time. No matter if a node dies…boot another. No matter if a container dies…start another. Use of a pattern like this gives us some additional flexibility in the Docker project graph driver layer as well. In order to deliver page-cache sharing, POSIX-compliance and SELinux support together, Vivek and I began prototyping a new design (which we’re calling the shared-rootfs). This technique is not terribly new and has been used by several other systems in the past. But it is new to the Linux container ecosystem. Vivek has prepared a patch for the Docker project here and Dan Walsh has a patch to add SELinux support to runc here. The new –shared-rootfs daemon option has very important implications for usability, performance and density. When –shared-rootfs is passed to the docker daemon at start-up, any container run as –read-only will automatically share it’s rootfs with the base image. 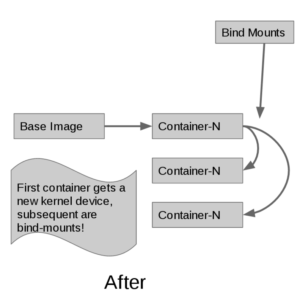 Using a bind-mount allows us to achieve our main goals: page-cache sharing, optimal density of containers per system, startup speed and POSIX compliance. This was done on a 16-core system with 128GB RAM, RHEL 7.3 Beta, a single SSD for all tests, and used docker-1.12 plus Vivek’s patch. dm-ro is 25% faster than overlay2 and 250% faster than dm-rw. As reported in the previous blog, devicemapper (dm-rw) does unique I/O for each container start, because there is no page-cache sharing. Note that the dm-ro and overlay2 modes do I/O at the very beginning to start the first container, but then no I/O after that. Exactly what we want — the behavior of a shared page-cache. 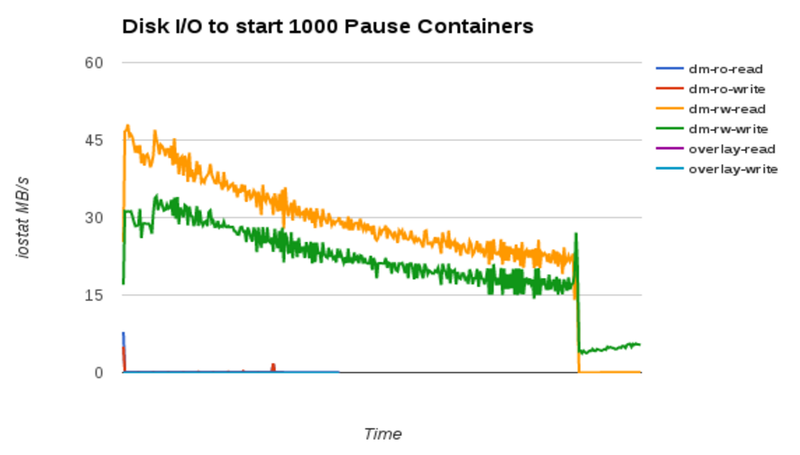 How does it affect individual container start times? 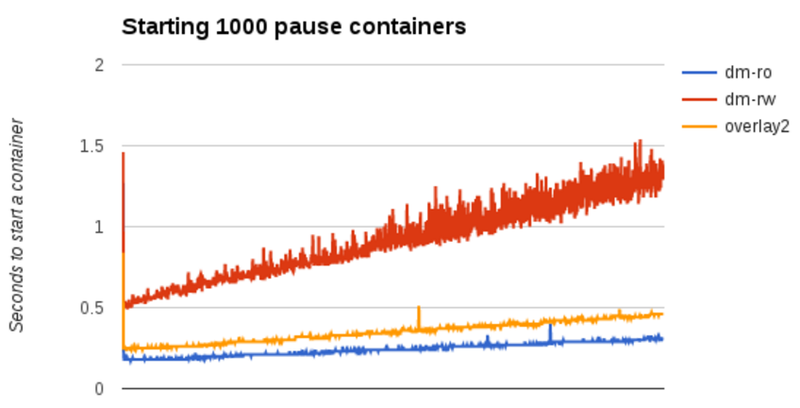 Regardless of the graph driver, containers take an increasing amount of time as more containers are running. 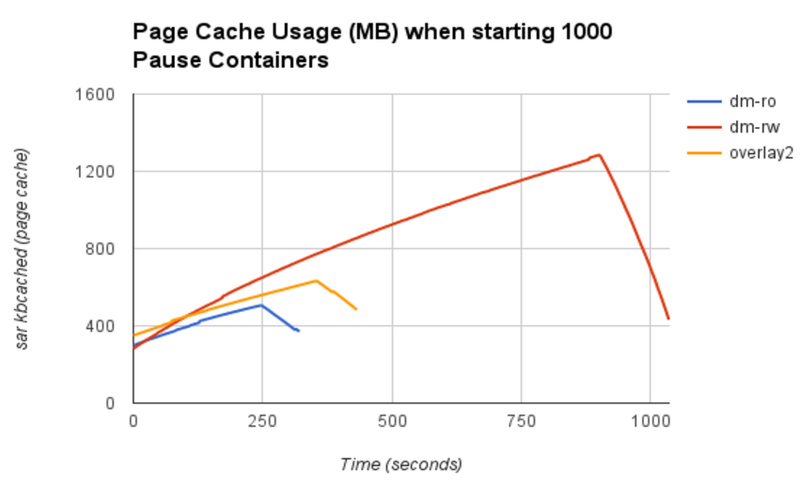 Notice again the initial spike when the base image content is pulled from disk into page-cache. Note that dm-ro is now consistently faster than overlay2 by approximately 50 milliseconds, and significantly faster than dm-rw. Approximately 1GB memory is saved when comparing dm-rw with dm-ro. Slightly less memory used by dm-ro when compared with overlay2. We believe the same shared-rootfs technique can be brought to other graph drivers as well — vfs and overlay2 included! Having a single graph driver deliver the performance you want, with the security and POSIX compliance you need on-demand, at runtime…is a powerful new capability. This performance data and efficiency improvements are taken from an ideal scenario of a single image being run 1000 times in order to clearly demonstrate the improved behavior. Efficiency improvements will vary when using –shared-rootfs, largely depending on image re-use patterns in your environment. Assuming a typical production scenario where a smaller, well-curated pool of properly secured and patched base images, we do expect measurable benefit from this technique. Vivek has submitted a first cut of implementing shared-rootfs to the Docker project for review. We look forward to iterating on the design with the community, and ultimately seeing it through into Red Hat’s products!